I thought it was great when Colette Patterns announced they were adding sizes up to 3X in their new knitwear line, but now that I’ve seen the patterns I’m not so sure. There’s a difference between patterns that fit larger sizes and patterns that flatter large sizes and you can see the difference in the 2 patterns Colette released. The Moneta dress has a simple fitted bodice and a full skirt. From the models used by Colette to the ladies in the Curvy Sewing Collective – it’s looked good on everyone. This is a flattering pattern and one I plan to make. 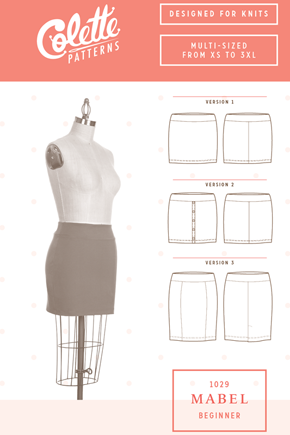 The Mabel skirt is a pattern that fits but doesn’t flatter anyone with a tummy…including me! This pattern is designed with negative ease – that means it’s actually smaller than your measurements and stretches over your body. What does that mean? All of your bumps get accentuated. On dress like Moneta – its accentuating your breasts which is a nice thing for many women. But I don’t know many women who really want to highlight their belly pooch. Colette used a standard size model and a plus size model for their shoots of this pattern – which is fantastic because you can see how it works on a curvier figure. Unfortunately despite the plus model being totally gorgeous, that pink skirt looks terrible on her. When a garment looks bad on the model, what hope does a normal person have? So while I have already purchased fabric to make Moneta, I’ll be skipping Mabel. I hope in future patterns, Colette takes into consideration we want our clothes to fit and flatter us. There’s nothing worse than spending all the time and money to sew a garment to realize it just looks bad on you.